Nightmare level horror coding. 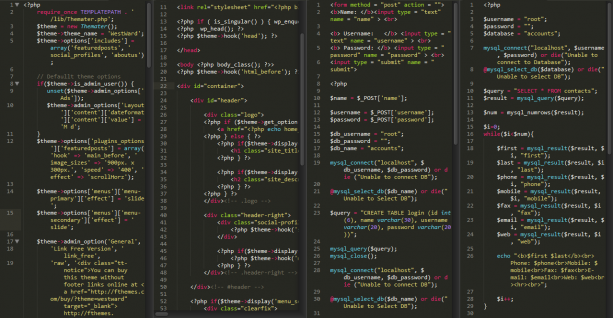 4 columns of programming in 13″ Screen! We should be the part of producer, not consumer. We have been blindly consuming stuffs which neither helps us nor the planet. The best example I can think of is watching Television and eating unhealthy junk foods. Those are two things which you can easily find people consuming everyday. People buy stuffs they don’t need, with money they don’t have, to show people they don’t like. The worst part is that they consume a lot and produce nothing. Consuming mediocre stuffs to impress others is by far the most stupid act any human being can perform. Internet is also another place where people consume a lot – mostly informational. Internet was one element which I couldn’t stop consuming after eliminating everything else. The connection never ends and it takes most of our time without us even realizing about it. Mostly blogs, news and social networking occupy our time. The best approach you can take to control it is to eliminate and automate. Eliminate blog post subscriptions, facebook friends and automate them. For that read this article from zenhabits. I am not the only one to say that consuming is worse than producing. All the people who have had struggled to make this world a better place has always said that. Here’s except from Russell Kirsch, the inventor of the world’s first internally programmable computer. “I’ve been against Macintosh company lately. They’re trying to get everyone to use iPads and when people use iPads they end up just using technology to consume things instead of making things. With a computer you can make things. You can code, you can make things and create stuffs that have never before existed and do things that have never been done before. This is one of the reason I probably will never use iPad. I want to create and produce stuffs, not consume. We’re going to die one day. It’s so uncertain. Go and stand still in the middle of the road and you’re gone. There’s always some hard rule in life. So it basically comes down to not regretting at the end of our lives. There are primarily two things which we regret at the end of our lives – at least for me. One is that we didn’t live our life to the fullest extent and other is that we didn’t leave a legacy behind by enriching the lives of people living on earth. If we could enrich the lives of people currently living in this world then there’s even more chance for it to help people living in the world after that. It’s do or die. Most people die living a mediocre lifestyle. They never do anything worth in this world. It’s clear that you need to create or produce stuffs in order to enrich the lives of people living on this planet. That’s one of two possible ways you won’t regret your life at the end. You need to produce or create things/ stuffs/ ideologies. It might be a book, a video, a painting, a speech, a song, anything! There are plenty of things you can create to leave a legacy behind. If you have a good philosophy or good ideas, don’t leave them, write somewhere or give a speech about it. Those things will help people. It doesn’t need to be really huge help but target high. Targeting high will make you end up at least somewhere at the middle. It’s good to try and do that. If you don’t want to leave a legacy behind then all you need to do is consume. The problem is that we don’t even consume good stuffs, only mediocre or bad. If you want to have a relaxing time go to a museum, go to art galleries, read books. Go to places that inspire you to work hard. I get inspired when I visit museums, world heritage sites, temples, or when I watch a good movie, documentary, or read books. Creating these types of stuffs require enormous hard work. So, it will inspire you to create something of value. Different people have different preferences. Figure out what inspires you the most and consume it during your free time. Most people just don’t make use of their free time. The whole world has advanced till today because of some remarkable break through. People who innovate new things are the ones who take this world forward day by day. It’s really a big difference. Always try and be the part of the producer not consumer. Anything that’s designed to consume will not benefit us at all. Let me say it again – It simply won’t benefit! I like the idea of innovating and producing new stuffs so that the world can advance through it. If we keep consuming things then it’s not possible because consumerism is like an addiction. You can’t come out of it. It’s like asking chain smokers to stop smoking. It’s too late when you realize it. You probably won’t realize that you are consuming things which you shouldn’t consume. You’ll regret this at the end of your life, not now. You are chained and wired in consumerism. And those big business houses don’t want you to know about their secret plan to persuade you to consume their products which will not benefit you in anyway. Since you wont consume their product they start to force it into you through attractive advertisements. Perfect example is Mc Donalds. Look how they persuade children through their advertisements. That’s one of the worst things you can ever eat. It kills you. Since they can’t make good food they make good and attractive advertisements and schemes. All they care about is money. Look the way they make your food and advertisement. There’s a vast difference. Food is crap but the advertisement is really attractive. That’s because they use you to earn money. The more you consume, the more profit margin they’ll have. They want to create profit margin that will last forever. At last, It’s not only with food or technology. It’s with everything. You should be aware about what you consume. Let it be news or food or latest technology or clothes. Consuming makes you weak. Stop consuming and start producing! Awesome stuff man!! Way to focus on producing and not consuming. Keep rocking !! I loved reading this post eventhough it’s kind of ironic how I found it: while consuming! But still, I’m going to print out the entire part where you said “We’re going to die one day……They never do anything worth in this world.” and hang it up in my room. It hit me like a brick! Keep up the good work! TV serials are lethal. It affects your brain in a negative way. Watching serials for entertainment is a different thing. The problem occurs when you’re hooked into it. When you set the habit of watching TV serials everyday, you’ll start feeling lonely when you don’t get to view it. You’ll feel like it’s a part of your life, and without it, you’ll have hard time living your life. When I was a kid, I used to watch lots of serials and TV channels. It was my daily routine. If I had to live a day without TV, it would be very painful. I’d only travel to places where I could watch my TV shows. If I could watch those channels or shows, I’d feel at home. If not, I’d suffer. After TV serials become a habit, you don’t live in the reality anymore. You start to live in the virtual world. When that happens, you are basically escaping yourself from your reality. To some extent, it’s fine until here. But the problem starts when you don’t get to watch your favorite TV serials. Basically, when you watch your favorite TV serials, you will have huge emotional spike on your body. Because serials are designed to make you feel strong emotions. If you stop watching those serials, you won’t get those storing emotional spike which your body craves for. And when you don’t get those emotional spikes, you start to create that virtual reality in your existing environment. You will start to create drama in real life unconsciously like in those TV serials to gain that emotional spike which your body wants so badly. And by doing so, you’ll completely destroy your own sense of reality. It’s a self destructive behavior. Just like how a druggist will face difficulty living without drug, a person who has a habit of watching TV serials will face difficulty while living without it. It basically becomes a addiction. These are the basic reasons why I don’t watch Television, and why you shouldn’t too. If it’s already a habit, slowly cut down and eliminate it. If not, at least be conscious of what those TV serials are doing to your brain and your reality. Most of the problem occurs due to unconscious consumption of those TV serials.